The SMARTPLY SITE PROTECT PLUS OSB3 comprises of cross oriented layers of flakes of selected softwood timber bonded with synthetic resins and waxes. 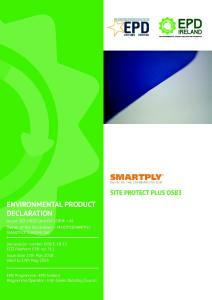 SMARTPLY SITE PROTECT PLUS OSB3 is manufactured in accordance with the requirements of I.S. EN300:2006 Oriented Strand Panels (OSB) – Definitions, classification and specifi cations. SMARTPLY SITE PROTECT PLUS OSB3 is a highly engineered and improved moisture resistant OSB3 coated panel specifically designed for use in hoarding applications. The substrate is coated with a smooth, heavy duty, exterior, cross-linked polymer surface treatment.